↑ "Boston Marathon bomb blasts kill 2, injure dozens". CBC News. April 15, 2013. สืบค้นเมื่อ April 15, 2013. ↑ Sherwell, Philip; Swain, John (April 15, 2013). "Boston Marathon explosions: two dead, 23 injured as 'bombs' hit race finish line". UK: The Daily Telegraph. สืบค้นเมื่อ April 15, 2013. ↑ Maresca, Cara. "Patriots' Day: Waco, Oklahoma City, Columbine, and now Boston". MSNBC. สืบค้นเมื่อ April 16, 2013. ↑ 6.0 6.1 6.2 Levs, Josh (April 15, 2013). "Deadly bombs strike Boston Marathon; authorities discover more bombs". CNN. สืบค้นเมื่อ April 15, 2013. ↑ Levitz, Jennifer; Helliker, Kevin; Germano, Sara (April 16, 2013). "Two Explosions at Boston Marathon Finish Line". The Wall Street Journal (online ed.). สืบค้นเมื่อ April 16, 2013. ↑ Winter, Jana. "At least 2 dead, dozens injured after huge explosions rock Boston Marathon". Fox News Channel. สืบค้นเมื่อ April 15, 2013. ↑ Hines, Ken (April 15, 2013). "U.S. Official: 2 Additional Explosive Devices Found Near Boston Marathon". ABC 6. สืบค้นเมื่อ April 16, 2013. ↑ "WSJ Backs Off Report of Additional Explosive Devices In Boston". April 15, 2013. สืบค้นเมื่อ April 16, 2013. ↑ Williams, Pete (April 15, 2013). "How many explosive devices, and where?". NBC News Special Report. Washington, DC: NBC. สืบค้นเมื่อ April 16, 2013. 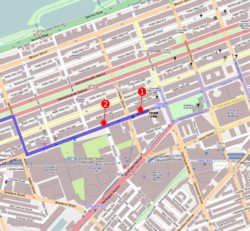 ↑ "Police will have controlled explosion on 600 block on Boylston Street, a block beyond the finish line". Boston.com. April 15, 2013. สืบค้นเมื่อ April 15, 2013. ↑ "Mass. gov: No unexploded bombs at Boston Marathon". Boston.com. สืบค้นเมื่อ 16 April 2013. ↑ Arsenault, Mark (April 15, 2013). "Three killed, more than 100 injured in marathon blast". Boston Globe. สืบค้นเมื่อ April 16, 2013. ↑ "3 Dead, At Least 130 Hurt In Explosions At Boston Marathon Finish Line". WBZ-TV. April 15, 2013. ↑ Lavidor-Berman, Adrienne (April 16, 2013). "Live blog: Bombings at the Boston Marathon". The Boston Globe. สืบค้นเมื่อ April 16, 2013. ↑ "http://hk.apple.nextmedia.com/realtime/international/20130417/51352522", Phoenix Television, Apple Daily, 2013‐4‐17 Check date values in: |date= (help); External link in |contribution= (help); |access-date= requires |url= (help). ↑ "Local paper names Chinese victim in Boston blasts". The Huffington Post. April 16, 2013. สืบค้นเมื่อ April 16, 2013. ↑ "Chinese graduate, 23, was 'living her dream of studying in the U.S' when bomb killed her: Third Boston victim named as vigils held". Daily Mail. April 17, 2013. สืบค้นเมื่อ April 17, 2013. ↑ "FBI takes over investigation, seeking suspects, motives in Boston bombings". Central Florida News 13. สืบค้นเมื่อ April 16, 2013. ↑ "At least 2 dead, 23 injured in explosions reported at Boston Marathon". Public Radio International. สืบค้นเมื่อ April 15, 2013. ↑ "2 dead, more than 100 hurt from Boston Marathon bomb blasts". WMBF. April 15, 2013. สืบค้นเมื่อ April 15, 2013. ↑ "3/2050 NOTAM Details". Federal Aviation Administration. April 15, 2013. สืบค้นเมื่อ April 15, 2013. ↑ Dickey, Christopher (April 15, 2013). "Many Cities on Alert After Boston Bombing". The Daily Beast. สืบค้นเมื่อ April 16, 2013. ↑ "Boston Marathon Explosion Video Footage" (graphic video, live updates). The Huffington Post. สืบค้นเมื่อ April 15, 2013. ↑ "Boston Police, EMS and Fire Boston Marathon Explosions Response Radio Transmissions". สืบค้นเมื่อ April 15, 2013. ↑ "Boston Marathon Blasts Kill 3 and Maim Dozens". New York Times. สืบค้นเมื่อ April 15, 2013. หน้านี้แก้ไขล่าสุดเมื่อวันที่ 29 ธันวาคม 2560 เวลา 19:06 น.